In my rose garden yesterday. The only rose bush to survive many hurricanes, and harsh winds and thunderstorms, that my mother planted almost 60 years ago is still producing flowers for me to photograph. Thanks for looking and\or commenting. For a better view click on the photo to see it in my Flickr. 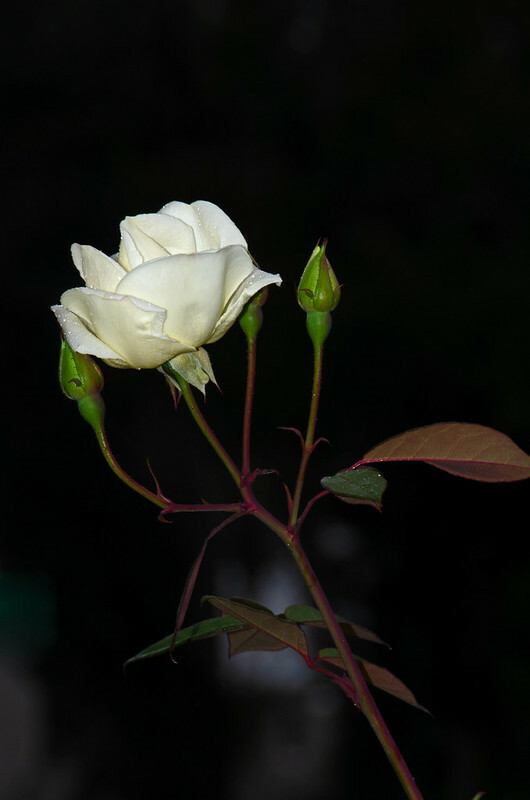 Great clarity and the black background works well with the subtle creamy off-white of the rose. Btw, no PP just a crop of the original RAW file. Really well done! I looked at it on Flickr and the lighting and details of the rose are beautiful. It's a beautiful thing - and an amazing survivor - very nicely photographed! There's something about (lone) flowers in the dark that has such a romantic appeal. A very lovely capture of such a beautiful flower. Nice work. Thanks Jer, appreciate you looking and commenting! Nice photo and nice backstory. I have extra love for plants that span a family generation or more . Thanks Brian. I counted five flowers on it this morning but I was on my way to do some business and couldn't stop to take more photos of them.